Welcome to " :-DimpleArt.com " - a complete one-stop shop for affordable custom designed caricatures and caricature products, like t-shirts, mouse pads, and other fun and personalized merchandise. With decades of experience in traditional cartooning, and years online creating high quality caricatures for many satisfied customers around the world, we have the skills and experience to bring your ideas to life and produce high quality caricatures that really resemble the picture you submit. Once you've made any caricature order, you can create your own database of caricatures from which you can view or download files from your personal collection of digital caricatures by simply logging into the Member's Area. Use your caricature files to create unique e-card greetings (software is available for free), or as clip-art to decorate groovy name cards or personalize your labels, stickers, and stationary, and much more. Since the digital caricature is yours for keeps, you can be as creative about its usage as you like. 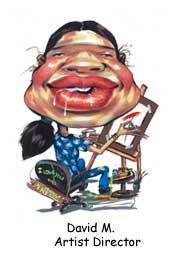 We even let you edit your caricature by yourself, so get ready to let your imagination go wild! Search for celebrities' caricatures and their products in a snap by typing either names or initials. Get your own caricature drawn by us in a digital format and/or print out on many choices of physical products including t-shirts, mugs, mouse pads, etc. Buy the finest high-resolution caricatures of celebrities or custom-made caricatures that you can use in your art work or for any purpose you like. Order your caricature drawn with any special requirements, such as monotone caricatures for use in publishing, and we will specifically make them for you. Get our Caricature Software that you can use to edit any caricatures. Download heads, bodies, and backgrounds from our site to use with the Caricature Software to create many variations of the caricatures. Send caricature e-card to your friends for free. Download caricature wallpapers for free.